It’s Friday and I’m bringing the party salad. 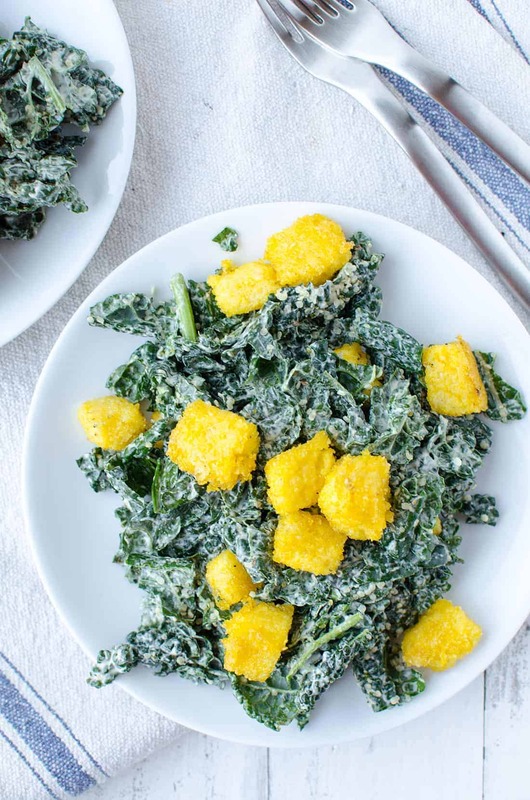 Spicing up regular, boring old kale Caesar with crunchy, crispy polenta croutons. It’s like the Miley Cyrus of the VMAs. It must be spring in the air, because suddenly all I want are salads. Mango and avocado salads; beet and berry salads; Cobb Salad; if it’s got fresh, vibrant produce in it, I want it. 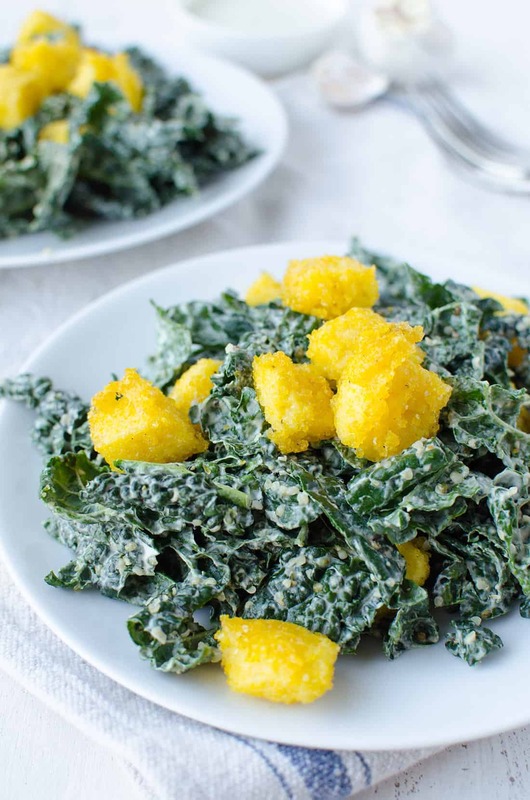 I know that kale salads are soooo 2014, but I am still riding the Kale train! Our CSA has been overflowing with kale over the past few weeks, and I just about fist-pump each week when opening the box. Curly kale! Check. Tuscan Kale! Double check. Mustard Greens? Eh. I still don’t love you but I’m trying. Anyone want to trade mustard greens for kale? Fill up my sink with cold water. Let them soak for 30 minutes or so to get rid of the bugs (yay organic produce!). Then, I dry them really, really well (with a salad spinner and then a towel), stack them onto sheets of paper towels, roll tightly and place in a large plastic bag to put in the crisper. 45 minutes of my time each week allows me to enjoy minimal prep whenever I am craving smoothies or salads. This trick works for just about every type of green: romaine, red leaf lettuce, other kinds of lettuce, kale, mustard greens, chard and collards. So, since I’ve been eating a ton of salads lately, I figured I could splurge a little on adding polenta croutons. I am totally copycatting a local restaurant that serves the best salads. My go-to favorite has four types of lettuce, kale, avocado, corn, tomatoes, and polenta croutons! It’s a good thing I like all the other ingredients; otherwise, I’d be ordering the salad just for the croutons. To be sure, I eat all of the croutons in one sitting and then dig into the salad. So, so good. To make this salad come together in mere minutes, opt for pre-cooked polenta that you buy in tubes at the grocery store. Admittedly, I made my polenta recipe, then cooled it for 2 hours and cubed it, but only because I had the ingredients on hand. Either way, cube the polenta, toss with salt/pepper and seasoning of choice: dried herbs, red pepper flakes, parmesan cheese, it all work. Then bake or fry. Like most things in life, these will taste slightly better fried then baked, but either way is delicious so choose what’s best for you. To fry, add a bit of olive oil to a pan (I go for the cast-iron) and then lightly saute on each side until crispy. Drain on a paper towel. To bake, add in a tbsp. or so of oil with the seasonings and shake to combine. Place on a baking sheet in a single layer and bake for 25 minutes at 400 degrees F.
While the polenta is baking, make the dressing. This dressing is so, so good. And dairy-free, thanks to cashews. I actually wasn’t planning on making such a creamy dressing, but I had a bunch of cashews pre-soaked from a recipe earlier in the week that I wanted to use up. Creamy Caesar dressing will always remind me of my grandmother and her obsession with Cardini’s Caesar dressing, so in they went. 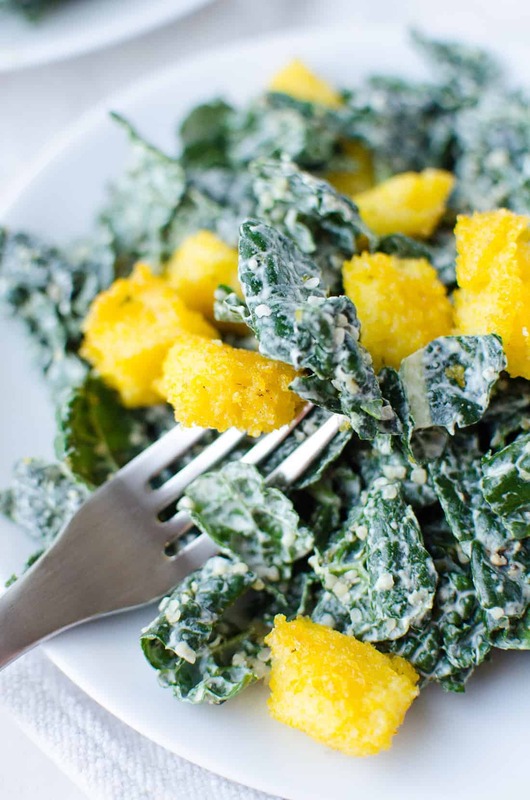 Creamy dressing, fresh kale, crispy croutons and a sprinkle of hemp hearts. Done. Enjoy your weekend! Tear kale leaves and place into a bowl. Set aside. Cut the polenta into small cubes or triangles. Toss well with cornstarch so that all the polenta gets coated. 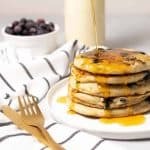 Heat a cast-iron or non-stick pan over medium heat. Add the olive oil and lightly fry the polenta on both sides until crispy, about 2-3 minutes per side. Remove from pan and let cook on paper towels. Season to taste with salt and pepper and let cool slightly. Place all the ingredients in a blender and puree until smooth. Toss leaves with dressing (might not need all of it). Season to taste with salt/pepper. 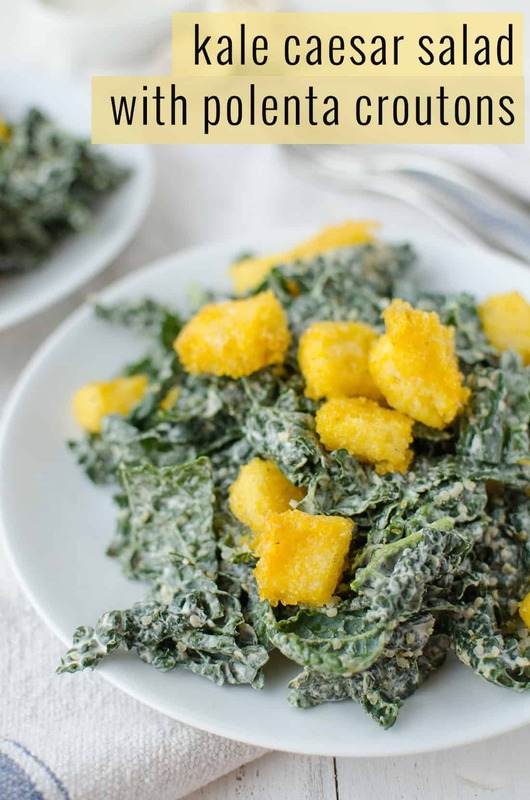 Love the idea of polenta croutons! 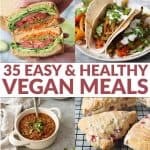 Sounds like they are so simple to make – I’m going to have to try! This is so great! 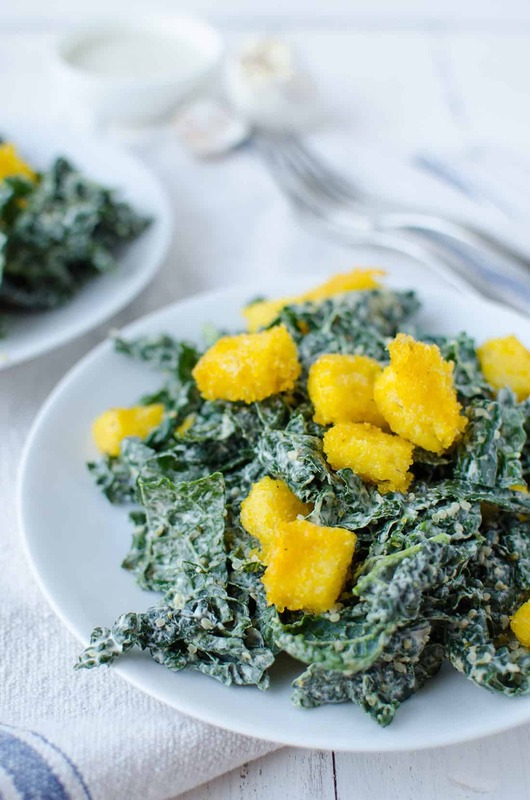 Awesome use of polenta! 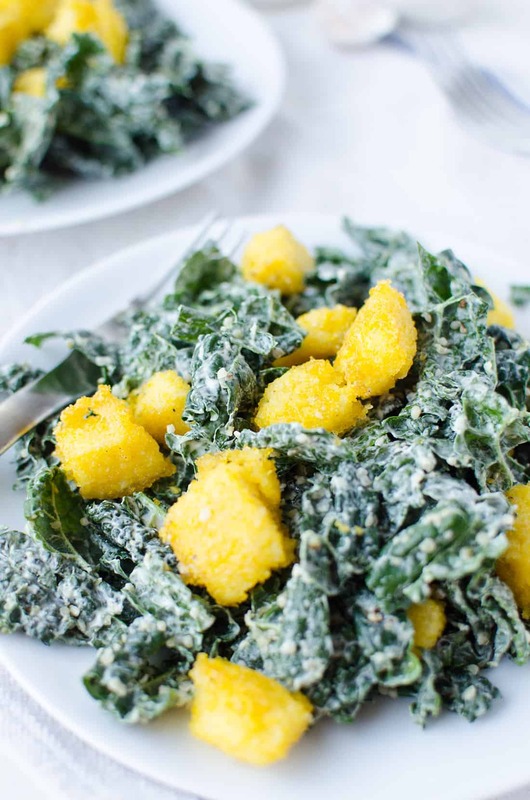 Polenta croutons? Alex that is brilliant and yummy!